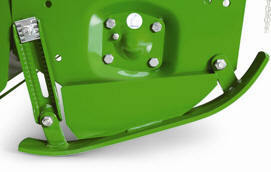 Implement to tractor hookup is simple with the Quick-Coupler category 2 compatibility. 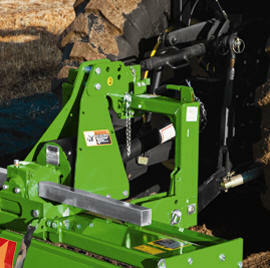 The hand crank makes adjusting the depth of the roller easy on the RT22 and RT23 Series Rotary Tillers. 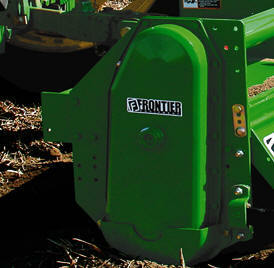 Use a lower setting for more firming action, ideal for controlling wind erosion. 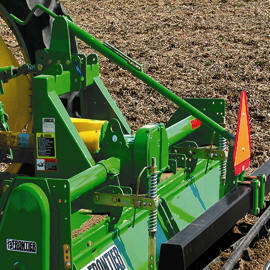 The RT22 and RT23 Series have an optional hydraulic cage roller adjustment kit available to allow for depth adjustments without leaving the tractor seat. Easily adjust the working depth by adjusting the height of the skids with the adjustment bracket. If rotary tiller is equipped with the optional cage roller, the unit will still be equipped with skid shoes for wear protection. The gear case is protected from abrasion and premature wear with the heavy-duty wear shields. The helical-shaped rotor decreases horsepower required to drive units. 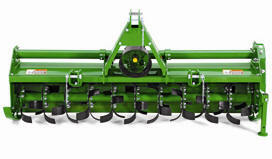 They are designed so they enter the field at different times for more efficiency.